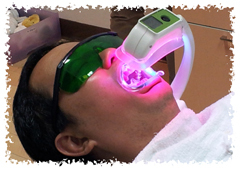 - No other teeth whitening procedure produces faster results. - This is the safest form of tooth bleaching. - Gum and tooth sensitivity (formerly drawbacks to in-office bleaching) are more controllable today due to thicker peroxide gels (that don't soak into the teeth as much as previous gels) and the use of desensitizers such as potassium nitrate and fluoride. - In-office bleaching is more expensive than take-home alternatives. Its cost, on average, is $650, compared to $400 for take-home trays and under $100 for over-the-counter bleaching trays or whitening strips. - Results can be unpredictable, depending on factors such as age, heredity and the type of staining that is present. - In-office bleaching is not a permanent solution. Shortly after treatment is completed, the teeth resume accumulating stains. Many dentists therefore recommend home maintenance follow-up with a lower-percentage bleach that can be kept on the teeth for longer periods of time.